This creates an instance of the sw.DensityEstimator class. The DEFT density estimation algorithm is run as part as part of this object’s initialization process. 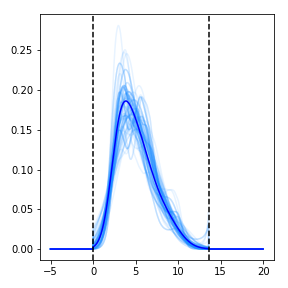 This will create a matplotlib figure resembling the one below. 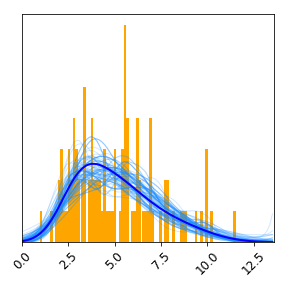 A histogram of the data is shown in orange, the optimal density estimate is shown in blue, and plausible densities are shown in light blue. Because the optional save_as argument is set, this plot is also saved to a PNG file. Other optional arguments to density.plot() can be used to specify styling options. See Documentation for more information. DEFT estimates each probability distribution on a grid contained within a finite bounding box. Both the bounding box and the grid were set automatically in this example, but these as well as other grid characteristics can be set by the user by passing additional parameters to the DensityEstimator constructor. See Documentation for more information. density.bounding_box: Lower and upper edges of the bounding box. density.grid: Locations of the gridpoints used. density.grid_spacing: Distance between neighboring grid points. density.num_grid_points: Number of grid points used. See Documentation for more information on the SUFTware API.